Crafted from solid pine wood, this product showcases slatted headboards, footboards, guardrails, and a built-in ladder. 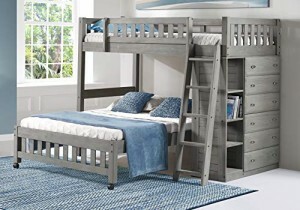 Utilizing every space within the bed’s structure, a fully assembled six-drawer dresser and four-shelf bookcase are built into the side to give you tons of storage opportunity, and when the kids grow up and want their separate space, the bottom full-size bed can be separated from the bunk. Features solid wood construction (no MDF or particleboard is used). Chest section ships fully assembled and includes 6 dresser sized drawers and 4 shelves. Chest section is reversible (can be used on the right or left side of the bed). All drawers feature solid wood construction and European roller drawer glides with positive stops, which prevent the drawers from falling to the ground if pulled too hard. The charcoal finish features an exciting brushed texture and slight black glaze that gives it a high-end weathered appearance. Wood knots and other finish imperfections may be present, which further enhance the weathered theme. Charcoal is a 6 step finish and is top coated with a durable wax with a subtle sheen. The finish works well with the brushed nickel hardware and while transitional, can certainly work as a contemporary or coastal finish.